For many years, traditional crowns have been used to strengthen teeth that are heavily filled, weakened, or darkened due to root canal therapy. Thanks to new technology, porcelain crowns look and feel like your own teeth. This is because the distinctive dark metal line or “Blue Halo” of old-style crowns have been eliminated. Porcelain crowns are now metalfree and so natural looking that they could be mistaken for real teeth. You don’t have to have the “Blue Halo” look with your new crowns. Ask how exciting technology can help create your new beautiful smile. A temporary dental crown/bridge is placed to protect your teeth and gums while a custom restoration is being created for you in a dental laboratory. This temporary will help prevent the adjacent teeth from shifting, ensuring that your final custom-crafted crown or bridge will fit perfectly. The effects of local anaesthetic should last for 3 – 4 hours. To avoid damage to your cheeks, tongue and lips avoid chewing and taking any hot drinks until the numbness has worn off. 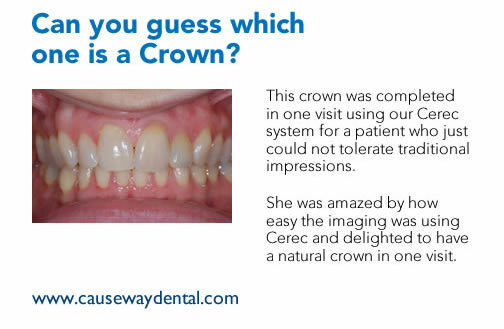 If you have any questions about porcelain crowns, please have a chat to one of our friendly team.